Moscow, October 23, Interfax - The Moscow Patriarchate sharply criticizes leader of Ukrainian Greek-Catholics (Uniates) Archbishop Svyatoslav Shevchuk. 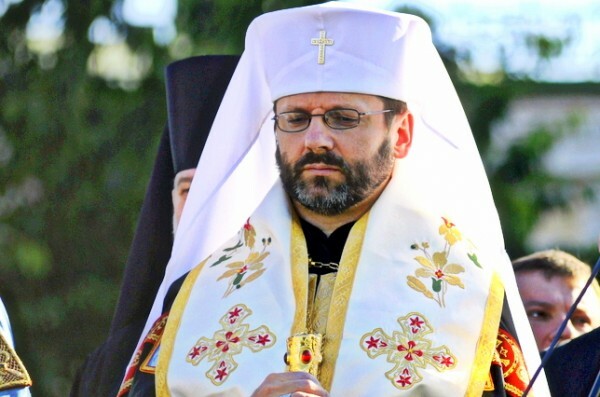 “The Unia in the person of its first hierarch in Ukraine, manifests itself again as a sad survival of the time, when the Catholics and the Orthodox regarded each other not as allies, but as rivals,” reads the statement of the Department for External Church Relations (DECR) posted on its website on Friday in response to Shevchuk’s interview with Austria’s Kathpress agency. “Like many other speeches of the hierarch, this interview is imbued with aggression against the Russian Orthodox Church and contains attacks on the canonical Ukrainian Orthodox Church, as well as politicized opinions on the tragedy unfolding in Ukraine today and insults to the Patriarch of Moscow and All Russia,” the document reads. “We clearly see double standard in the words of Archbishop Svyatoslav. From his point of view, the Ukrainian Orthodox Church, linked with the Moscow Patriarchate only by spiritual and prayerful bonds, should secede from it in order to get the right to call herself a national and patriotic Church, while there is no need for the UGCC, which is in direct administrative dependence on the Pope, to secede from him,” the document reads. The DECR points out that “cutting historical ecclesiastical ties between Moscow and ancient Kiev, “whence the land of the Rus’ came into being,” became the major slogan of the church schism formed in Ukraine in the early 1990s. “The arguments used by the head of the Ukrainian Greek Catholic Church are in tune with those of the schismatics. While speaking of the necessity to reformat the existing canonical order in the Orthodox world, the leaders of the unia and the schism place the “establishment” of a national Orthodox Church in Ukraine (as if there is no such Church in Ukraine) in direct connection with the separation of the Ukrainian Orthodox Church from the Moscow Patriarchate,” the statement reads. Its authors remind that the Ukrainian Orthodox Church is a self-governing Church, independent of the Moscow Patriarchate in administrative and financial matters. The only way the spiritual ties of the Ukrainian Orthodox Church with the Moscow Patriarchate manifest themselves is that the Patriarch is commemorated at the UOC parishes and approves, according to the UOC Statute, the election of a new Metropolitan of Kiev and All Ukraine. “The supreme authority of the Moscow Patriarchate has always believed it important that a full-fledged dialogue between the Ukrainian Orthodox Church and the UGCC should continue, since the dialogue is necessary, first of all, for restoring peace in the longsuffering Ukrainian land. However, the success in this matter can only be achieved provided that the rhetoric, aimed at stirring up interethnic and interconfessional hatred, is not used any more,” the statement reads.